Choosing the best outdoor motion sensor light is key to improving the lighting and security of your home. Motion sensor light will automatically light up even when you are not around and this keeps your home and belongings safe. Not only does it save you from the trouble of constantly monitoring your surrounding, but also ensures your environment is lit instantly for added security. There are many different kinds of motion sensor lights, some are powered by solar while others are battery-operated. Some come with poles that are fixed on the ground and others are hanged on the walls. 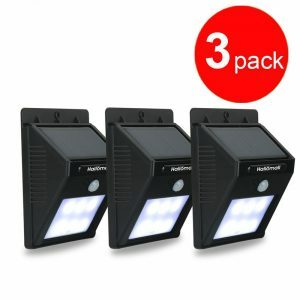 To help you make a wise decision and enjoy maximum satisfaction, we have reviewed the 10 best outdoor motion sensor LED lights in 2019. Superior motion sensing, hands-free design, strong battery capacity and versatility are all featured by 1byone LED sensor light. It has a strong 15oomAh solar-charged battery, several lighting modes (High, Dim, and High with sensor). The 1.6-watt LEDs light produce very bright light using its 8 super bright LED lights and the Pyroelectric Infrared (PIR) sensor can detect motion and heat up to a distance of 26.2ft/8m. This sensor light is waterproof, long-lasting battery. The Heath Zenith HZ-5411-WH sensor security light is a heavy-duty light that comes with adjustable sensitivity. It consists of two 120-watt flood that emit very strong and bright light, which will illuminate the outdoors. The light uses a 150i motion sensor that is sensitive to a distance of up to 70 feet while the selectable timer allows you to choose the duration (20 minute, 5 minutes, 1 minute and test). Although the light is very bright and its sensitivity is among the best in the market, the unit doesn’t come with bulbs. Therefore, you have to separately buy the 2 flood bulbs. The HalloMAll outdoor sensor light consists of a strong plastic compartment that houses 6 powerful LEDs that generate 100 lumens. It has a super-sensitive motion sensor that is effective within a 3-meter perimeter and a 120-degree sensing angle. When fully-charged, the battery can offer up to 12 hours of lighting and is suitable for any kind of weather. Reasons to buy the light are no need for battery, wireless, strong, and weatherproof. 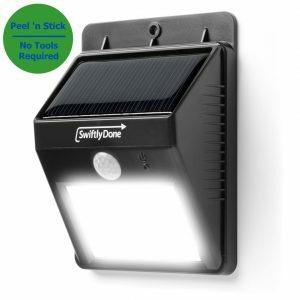 This is a solar-powered light only and has no dim mode. 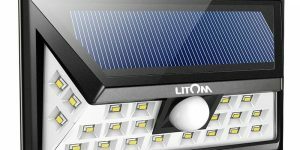 The Litom wireless motion sensor light is a more improved version of its earlier type and relies on 8 LEDs to produce bright illumination. The housing and lens are also constructed from sturdy material that can tolerate the elements and heat. The sensor ball has become bigger and more sensitive and is effective to a distance of 26 feet. 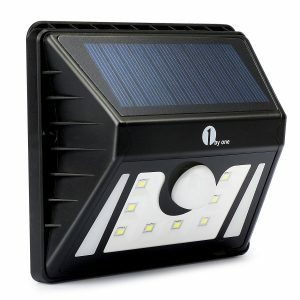 It features a weatherproof solar panel that quickly absorb the sun ray and generate the solar light. It has a very robust design, sensitive, long-lasting battery, and quick-charging. 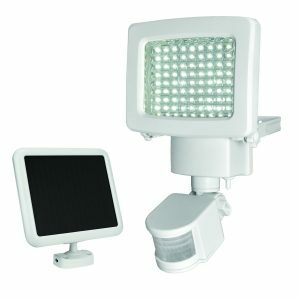 The Sunforce 82080 motion sensor light consists of a light and strong material that protects 80 led units. The product can be mounted on poles or on the wall to provide security to your pathway, backyard, driveway, garage or garden. It produces bright white color and doesn’t emit lots of heat. The outdoor light can be adjusted to work within 7 to 15 feet. The built-in sensor is not only very sensitive, but also lasts for a long time. The light is super bright and easy to mount whereas the disadvantage is that the mounting brackets are not very easy to work with. 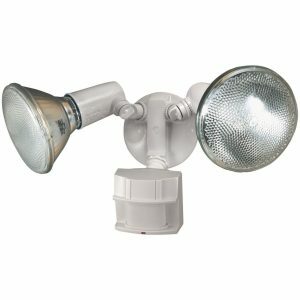 The Fulcrum 20031-107 motion sensor light comes with 6 built-in LED lamps that don’t burnout easily and can offer more than 20,000 hours of illumination. It comes with a special lens that disperses the light to a wider circumference. For easy adjusting, it features an adjustable fulcrum, which can turn at different angles. The highly-sensitive sensors will catch even the smallest movements and immediately light the LED lamp. It is very easy fixing, quality light distribution and light in weight. 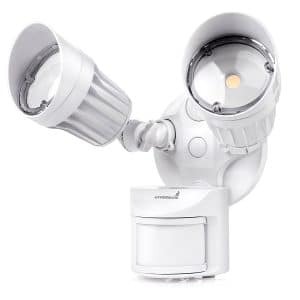 The Swiftly Done outdoor wireless light consists of several built-in LED lamps. 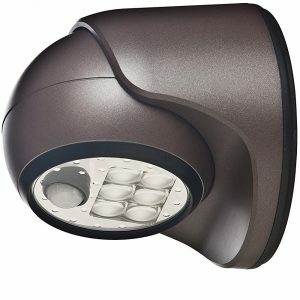 It consists of a heavy-duty plastic housing that protects the LED units and also provides longevity. It comes with an auto ON/Off switch that turns it on in the dark and on sensing motion and off during the day. 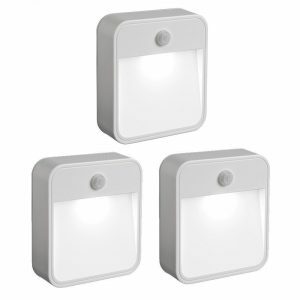 Reasons to like this light are they are very sensitive motion sensors, quick dimming, and bright light. Areas where it scores lowly include becoming dim too soon (within 5 seconds). 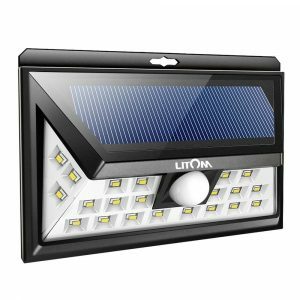 The 2-head Hyperikon outdoor motion sensor is solar powered with the 90 lumens/watt brightness. The corded solar light is IP65 weatherproof ensuring it will work in any extreme weather and protect your home’s security. To offer the ultra-bright light, it comes in 90 lumens/watt brightness with the sensor range of 30-40 feet. The notable pros are durability, affordability, cost-effective and wireless nature. The Mr. Beams MB723 comes in a pack of 3 LED lights that are designed for both indoor and outdoor use. It comes in a “stick-n-peel” design that only requires peeling a sticker then affixing it anywhere. It has a very light, but strong housing that utilizes the energy efficiently while keeping the unit cool. You will get 50,000 hours plus of reliable 20 lumen lighting. The sophisticated motion sensors easily sense the slightest motion and can work within a 15-feet range. Simple, strong, durable and energy-efficient are the main pros of this motion sensor light. 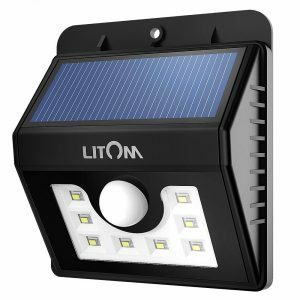 Litom motion sensor light is a motion sensor light that consists of 24 LEDs giving the bright light and can detect motion up to 10-26 feet away at a 120 degree angle. It is made from high-impact ABS material and is IP65 waterproof that can resist to any weather condition. It has 3 different lighting sensing modes: medium light mode, dim light sensor light mode and sensor mode. The simple design makes fitting it on a wall, pole or other places easy and straight forward. Gone are the days when you had to physically switch on or switch off the lights on the backyard, patio, garden, deck, driveway or walkway. Enjoy convenience and improve security by choosing the above mentioned motion sensor LED lights.